The tomb is the central focus of the entire complex of the Taj Mahal. This large, white marble structure stands on a square plinth and consists of a symmetrical building with an iwan (an arch- shaped doorway) topped by a large dome and finial. Like most Mughal tombs, the basic elements are Persian in origin. Taj Mahal appears pink in the morning, white in the day and changes its color to golden in the moon light. The pillars surrounding Taj Mahal are slightly tilted outwards so that in the event of an earthquake they will fall away from the tomb. 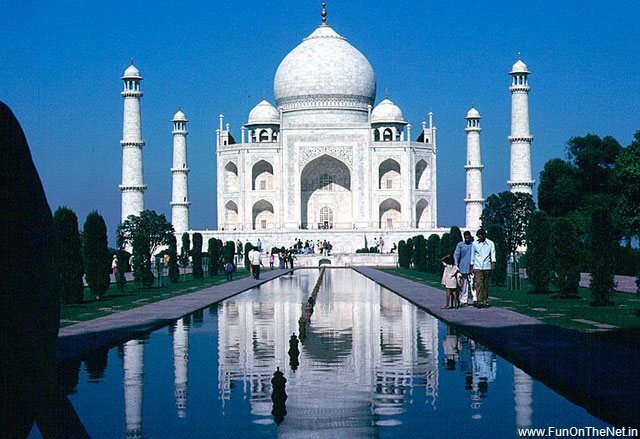 An identical Taj Mahal was supposed to be built in black marble instead of white. The base of it can still be seen across the river. Over 1,000 elephant were used to transport building materials during the construction. In all, 28 types of precious and semi-precious stones were inlaid into the white marble. The Taj Mahal in India is perfectly symmetrical, except for one thing. The two tombs inside are not equal in size. This is because the male tomb has to be larger than the female tomb.